I wish I had a dog. Not for the everyday cuteness or companionship. No, I want a dog so I can dress her up for Halloween. Just yesterday, I was checking out the links on Web Zen when I came across two remarkable dog costume options. I agree with international mastering, even if the dog in the wig was so funny. That's so cute. I wish I had a dog too. I think I need to buy my dog a wig. He'd probably wear it with no complaints. eww! 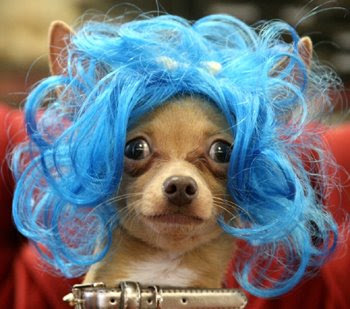 sorry, it cute and all, but i just cant stand it when people dress up their dogs, no offence. Sometimes i think that the owners forget that their dog is a DOG not a baby (once again, no offence to those who push their dogs in prams)! woah, it'd be weird to have like 7 dogs dress up as the irregulars. have like an albino Kiki dog! The unicorn thing's cute, but I don't really like the whole dressing up animals thing. I guess if the dog doesn't mind, my friend's dog likes wearing hats a lot, LOL. It's very fun to think about painting your pets different colors, but I don't think that's a good thing to do for real! But I want to get our dog a costume so we can laugh at how he looks wearing it. =) Just for a little while, then he can take it off. Hey Kiel, I have this really loud neighbour who has two dogs. I know one's called Susie because she's always like, "Susie! Susie darling come here!" She treats them like her children. You're right, some people DO forget that their dogs are not babies. When I was younger, we put our golden retriever and our collie in my and my sister's soccer shirts. ^^ Let me tell you, it was hard to get the shirts off. 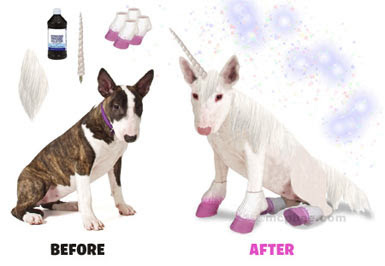 I meant the unicorn thing, and cruel Halloween costumes (ever seen a puppy in a Fanta bottle? ), not Patricia's thing with the soccer shirts. i went to the dollar general one time, and this lady was holding a chihuahua that she kept calling "snookums" but the chihuahua was dressed in a rubber plasticish thing that was supposed to look like leather Christmas style outfit,you know, mostly red with white cuffs with a hat to match and green lensed glasses! The poor dog looked ridiculous,sad and ridiculous.